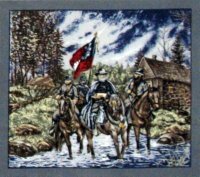 Civil war quilt patterns and civil war quilts supported the war efforts through fairs, raffles, & auctions. The role of the women was to hold fundraisers so the quilts had to be simple, fast and easy to make. They kept the sewing machines running day and night. 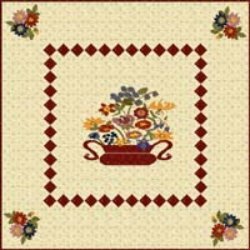 Below is a link for downloading this free pattern. The women in the North and the South designed and created Civil War Quilts to provide blankets for their soldiers during the War. Easy Quilts for the Soldiers! 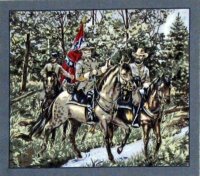 There were two ways that Civil War Quilt patterns helped the cause for both the North and the South. To help the war efforts, many civil war quilt patterns were made and sold at fairs, raffles, auctions. Others would simply donate money for much needed supplies and gunboats. 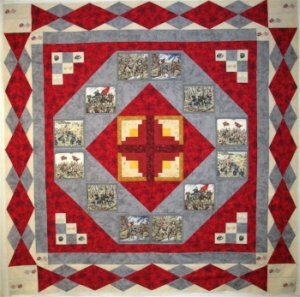 Most of all, civil war quilts were needed to warm the soldiers in the field and in the hospitals. 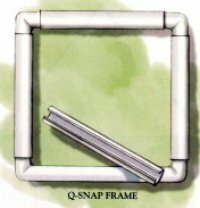 This put a great demand on the ladies to make their Civil War Quilt patterns into usable quilts. The Women Contributed by Raffling Civil War Quilts and Encouraging Donations! Northern women rallied to the call for clothing, blankets, and quilts. Not only did the women make new quilts but also existing quilts were contributed. As the war continued, supplies ran short and even precious heirloom quilts were remade into soldier’s quilts. Silk was fashionable for clothing during this period and silk American patchwork was considered quite elegant. 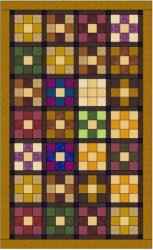 The log cabin quilt pattern first appeared at this time. It and other patterns were made up in silk, wool and fine cottons for these events. 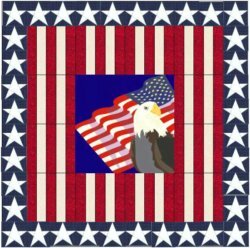 Fancy applique quilt patterns were also popular displaying floral and political motifs including the “eagle and flag”. As the Civil War progressed, many fancy patterns were used to make regimental unit flags and some were even made into company flags. The fife and drum core made up their own flag to include many of these patterns also. Many pennant type flags were made to identify the various units for both sides. Fundraisers to provide fabric for Civil War Quilt patterns were held at ball room dances which were attended by officers and their wives. The more refined quilts were auctioned off at the end of the dances to raise money for the war effort. Fundraising events helped provide money for needed fabrics. It is estimated that 250,000 quilts and comforters were made for soldiers. Gun Boat Civil War Quilts for the South! Southern women did what they could to help buy desperately needed gunboats. Beautiful Gunboat Quilts were made. These quilts displayed elaborate medallion style floral arrangements cut from printed fabric. The motifs were cut out and appliqued to solid fabric...this method is called broderie perse and requires very fine sewing skills. Through fairs, raffles and donations southern women raised enough money to pay for three of these ironclad gunboats. In 1862, the North blockaded the southern ports so the money earned went to hospitals for the sick and wounded instead. It became obvious that there was a desperate need for clothing and blankets for Union soldiers as the war was supposed to “only spill a thimble full of blood”. Unfortunately it drug on for over four devastating years. With nearly 626,000 casualties combined. Northern women were accustomed to gathering and sewing for a cause. Churches and abolitionist groups simply changed their focus to helping soldiers. An organization called the Sanitary Commission was established to prevent the death of soldiers from disease and injury. The urgent need for soldiers’ bedding became apparent. Women began to produce quilts specifically for the war effort. 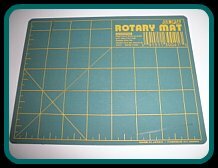 The military had requested the quilts be made about seven feet by four feet, the size of a military cot and bedding pack. As existing materials became scarce, money had to be raised to buy the fabric to make bedding for the soldiers. Southern women were hindered somewhat in producing quilts for soldier’s bedding because they did not have a tradition of sewing for causes. The wealthier women were accustomed to having slaves to do the everyday sewing. 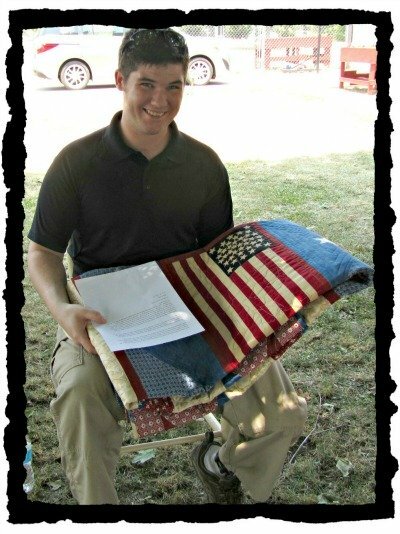 Nonetheless, many learned to sew and pitched in to help their soldiers. Once prewar textiles were used up fabric became scarce. 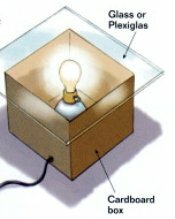 The South could not get goods in through their ports and had no real manufacturing base of their own. Calico was said to cost $25 a yard toward the end of the war. Eventually women had to make homespun fabric, a much slower process. Old mattresses were torn apart for fiber to spin. Even carpets were cut up and made into blankets for soldiers. As one can see, Civil War Quilt patterns varied greatly depending on the purpose of the quilt. The quilts covered the dead, covered the cold and hungry, was a great source for raising money for the war effort and lead the troops into battle. 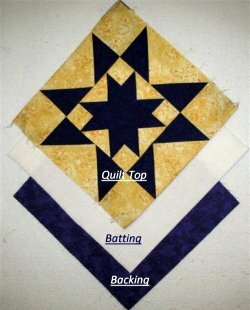 There were an abundant of choices for anyone wanting to make these Civil War quilt patterns to help fulfill the quota needed. 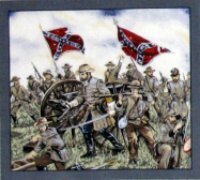 Easy Civil War Quilt patterns were used to quickly make quilts for soldiers as well as fine applique quilt patterns to raise money for the cause both in the North and in the South. Very Few Surviving Civil War Quilts! Very few of the Civil War quilts made for soldiers have survived mostly because these quilts got a great deal of wear and probably did not seem worth saving after the war. 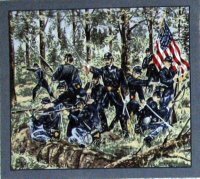 Many quilts were completely wore out, and many soldiers were actually buried in their quilts which are understandingly why these Civil War quilts are extremely rare today. The American Civil War (April 12, 1861 – 1865) was one of the most violent times in the History of the United States. More than 600,000 men gave their lives for their country in this war. This is more lives lost in one war than in all wars and conflicts combined following this period in time. This was a war between the two sections of our once happy and prosperous country the North and the South. There were many reasons for a Civil War to happen in America, and political issues and disagreements began soon after the American Revolution ended in 1782. Hiram Ulysses Grant, the man we know, as Ulysses S. Grant was a leader/General for the Union Military during the Civil War. Victories in the Civil War made Grant a national figure, and propelled him into the White House as our 18th president. Robert E. Lee, a career army officer and the most successful general of the Confederate forces during the Civil War eventually commanded all Confederate armies as General in Chief as the results of losing against superior forces. Vicksburg is the key. . . . “Let us get Vicksburg, and all that country is ours”, as quoted by President Abraham Lincoln, 1862. This is Union General Philip Sheridan born and raised in Somerset Ohio. Sheridan was known as little Phil, who led the Army of the Shenandoah. Together with the Union Cavalry, Sheridan began a ruthless campaign to clear the Valley of Rebel troops. This is the high tide at Gettysburg. In celebration of a break in the Union lines at Cemetery Ridge, General Lewis Armistead showed courage by piercing his hat with his sword. 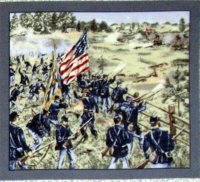 At the battle at Gettysburg Armistead received a mortal wound and nearly all the men with him were killed or captured. This is Winfield Scott Hancock at Gettysburg. General Hancock was a graduate of West Point Class of 1844 with exceptional leadership abilities and a determined devotion to duty, honor and country. He was upheld by his men as "Hancock the Superb", and one of General George Mead's most trusted and efficient field officers. 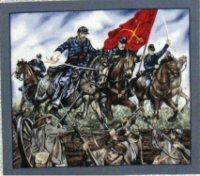 This is The Irish Brigade at Antietam lead by Thomas Meagher. General Winfield Scott Hancock assigned General Thomas Meagher to charge the Confederate lines at Antietam. Meagher was wounded as well as his subordinate officer, Richardson. The Brigade suffered a casualty rate of near 60 percent. This is the battle of Fredericksburg where Lee watched the battle unfold from the ridge. The Union General, Ambrose Burnside sent wave after wave of men against the Confederate Generals, Longstreet and Lee. It was a courageous but futile assault and the bloodiest engagement of the Civil War. This is the battle of the Wilderness of 1864. In dense woods, with forest fires raging everywhere, General Grant ordered General Mead and his Army of the Potomac to advance South rather than retreat to the North. This surprised General Lee and pressured him and his dwindling army. It also cut off Lee's supply lines to the South. A very tactical move by General Ulysses S. Grant that hastened the end of the Civil War. 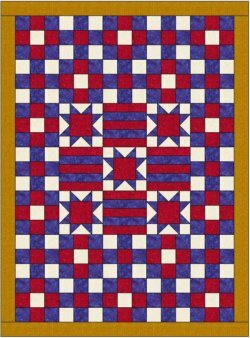 Try your hand with this FREE Civil War Quilt Pattern! 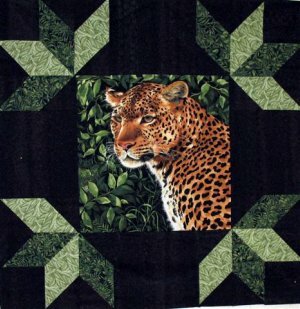 This easy quilt uses pre-stamped materials so that there is less piecing. 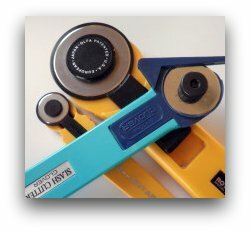 It will allow you to hone your quilting skills! Why not give it a try. Let us all stand PROUD of the good ole USA!